» Church S. Domenico M.
Help us find other gay travelers on Your cruise ship for a great shared gay tour only for You !! Samnites. The tiered seating was cut away to one side to allow the construction of a perimeter wall designed to support the foursided roof. The first seats in front of the orchestra hemicycle, which was paved with slabs of coloured marble chips, were reserved for the decurions and were laid out on top of four rows of wide tuffstone steps. 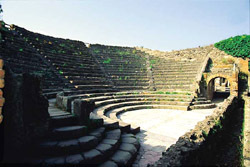 The tiered seating was served by semicircular steps to the sides of the orchestra. Boxes for the guests of honour were situated on either side of the stage area from which they could be reached, while three doors in the stage wall opened onto the backstage dressing room and from here led directly outisde. Book our Shore Excursions for Pompeii, Capri, Naples, Amalfi Coast and You'll see and do more than the big-bus shore excursions offered by the cruise lines, as well as enjoying a more intimate experience of the sights and places visited. And You'll PAY LESS than the price of the big-bus shore excursions offered by the cruise lines. Our Private Shore Excursions can be customized to suit your own particular needs. Discounted Prices offered when You book two or more Cruise Ship Shore Excursions. We offer Shore Excursions from the ports of Civitavecchia, Livorno, Sorrento and Naples that depart directly from your cruise ship. Create with us Your perfect holiday! Whatever Your individual requirements may be, You can be assured that we are expert at designing a personal itinerary in Italy, tailor-made specifically to Your needs. Your itinerary will be tailored around the time You have available to travel, Your sightseeing preferences, how many meals You would like included and most importantly Your budget. Let us take the hassle out of planning Your holiday by advising You on the most scenic routes with the quickest connections to save Your time. What’s more, You can tweak our initial proposals, making all the adjustments You need, so it really is a that perfect dream holiday designed exclusively for You.